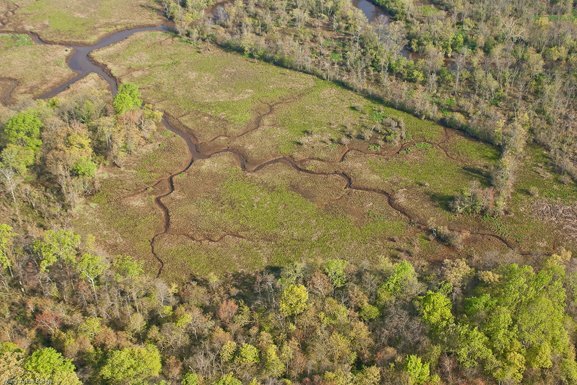 An aerial view of the Abbott Marshlands (Marshlands) reveals a rich mosaic of lush marsh and swampland, meandering tidal streams, ponds and beaver dams, islands dotted with trees, wooded uplands along the slopes of bluffs that surround three sides of the Marshlands, and the defining presence of the Delaware River. This natural oasis offers a refuge from the bustle of nearby city life, where a quiet walk, birding, and canoeing are possible. 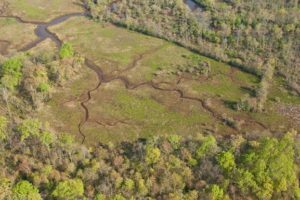 Marshland trails permit close views of many habitats and of the plants and animals found in them. Historical figures who passed along some of the same paths saw a different landscape, with changes related to retreat of the last glacier and to human activities. It’s not hard to imagine, perhaps on a misty morning, various residents, now long gone: the Indians who hunted, fished, and made uniquely patterned pottery; the European royalty – Joseph Bonaparte, once King of Spain, his daughter Zenaide, and his nephew Charles Lucien Bonaparte a scientist; and archeologists, Charles Conrad Abbott and Dorothy Cross who brought international archaeological fame to the area. For both the casual visitor and those who stay longer the Marshlands have much to offer. Just beyond the edges of this natural and cultural treasure lie the densely populated cities of Trenton, Hamilton Township, and Bordentown City and Township. The proximity of these urban neighbors makes the natural and cultural wealth of the Marshlands all the more surprising, precious, and worthy of preserving.